Find out more about our Corner Log Cabins range. 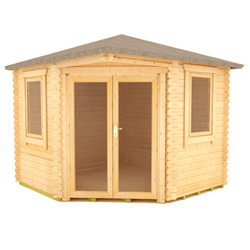 Designed to fit within the corner of your garden without intruding on your space our Corner Log Cabins provide a rich internal space perfect for long summer evenings. Made with 28mm interlocking logs and draft sealed windows, each cabin has been tailored to suit most environments and offers the ideal level of insulation throughout the year. Built with an increased overhang which protects against severe conditions such as wind and rain. With options to upgrade to the shingles adding an elegance to the design or add a flower planter to make it the centrepiece of your garden. You will soon become the envy of your neighbours.